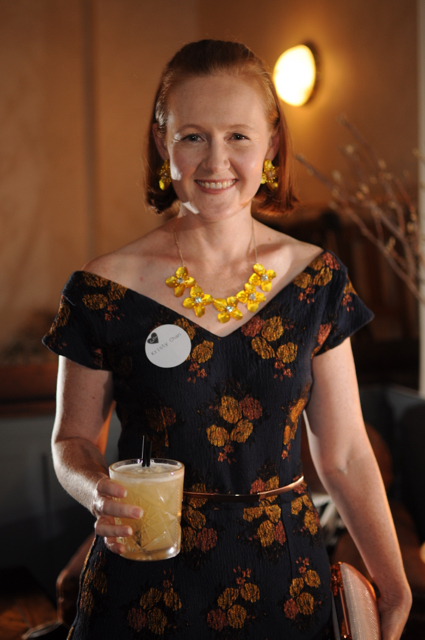 I was packing away my summer clothes on the weekend now that our weather has finally cooled down, and I came across a cocktail dress I made for the Sydney Frocktails back in February. I wanted to post it because honestly this fabric is just sumptuous and I think the dress looks fab. I bought this fabric from a high end fabric store in Sydney during their closing down sale late last year - at 50% off this fabric was still $80/m so it's definitely one of the more expensive fabrics I've bought. But it's worth it because it's so beautiful. 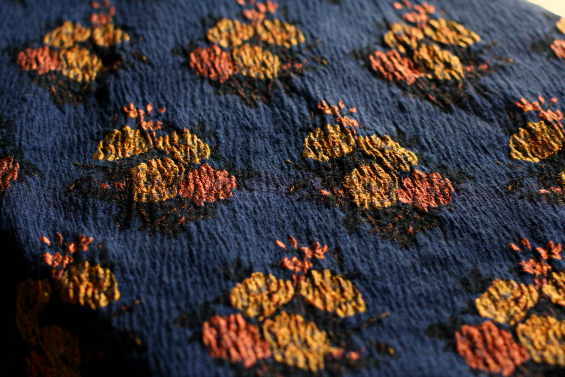 It's a dark navy blue silk/wool blend in a crinkle texture, with metallic gold and bronze flowers woven in to the fabric with a very soft hand and luxurious sheen to it. I really wanted to do a full skirt, but because this fabric was so expensive and at the time I bought it I didn't have a specific pattern in mind I just didn't haven't enough fabric. Wah! Why didn't I spend just that little bit extra at the time? 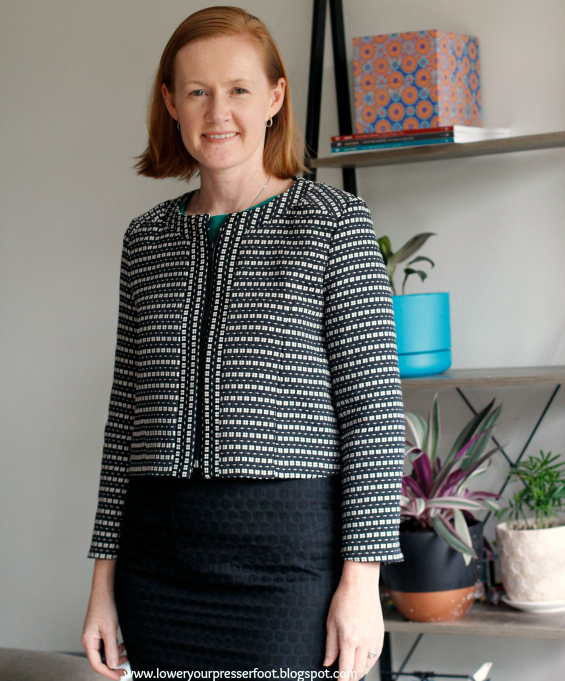 So I swapped out the pleated skirt for a fitted pencil skirt (just franken-patterned the skirt pattern from my beloved New Look 6968) and it worked just fine. As with nearly all of my projects made for a specific occasion, this was rushed at the last minute and I took some regrettable short-cuts. I made this the weekend before Frocktails, which was also the weekend before I spent the whole week at Susan Khaljie's French jacket course, so I had no time for a muslin. The bodice turned out a little too tight, so I had to let out the seams and the darts a little to make it fit which was annoying because the original sewing lines didn't really press out properly. Thankfully the fabric is quite dark so it's not too noticeable but if I had made a muslin I could have avoided it. The funny thing is I received many compliments on the night about the neckline, and I suppose it did showcase my very inexpensive costume jewellery quite well! 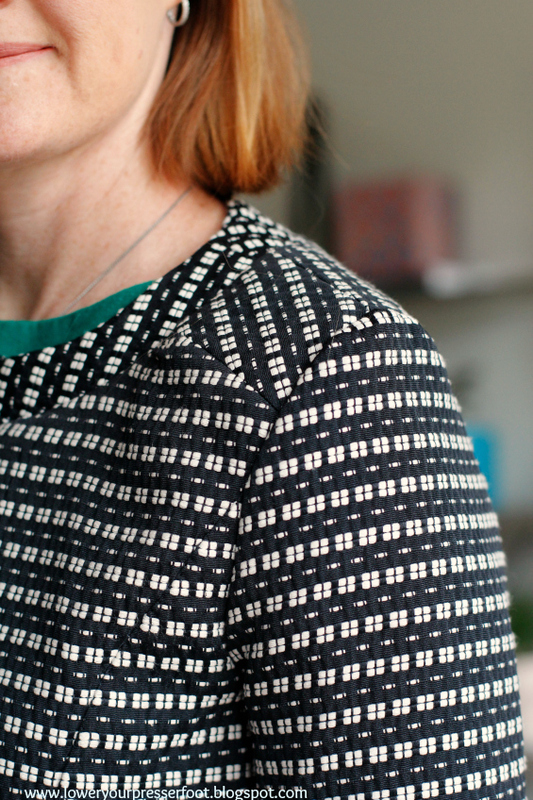 The interesting thing about this pattern is the diamond shaped gussets in the armpit, which forms the underpart of the sleeve. 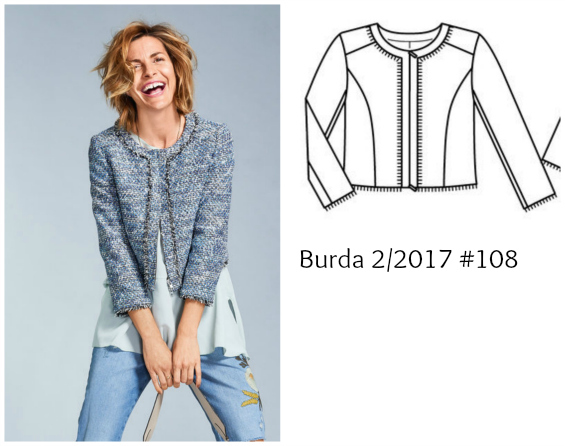 These aren't very common in patterns these days, and of course Burda's instructions left me scratching my head. 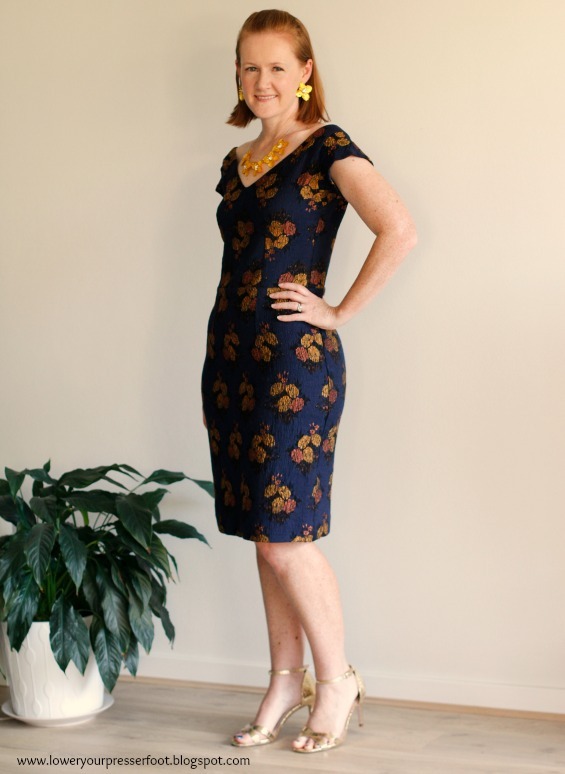 Thankfully, Sheryll over at Pattern Scissors Cloth has made this dress in 2011 and posted a series of detailed posts which were very helpful in figuring out how to sew this dress. 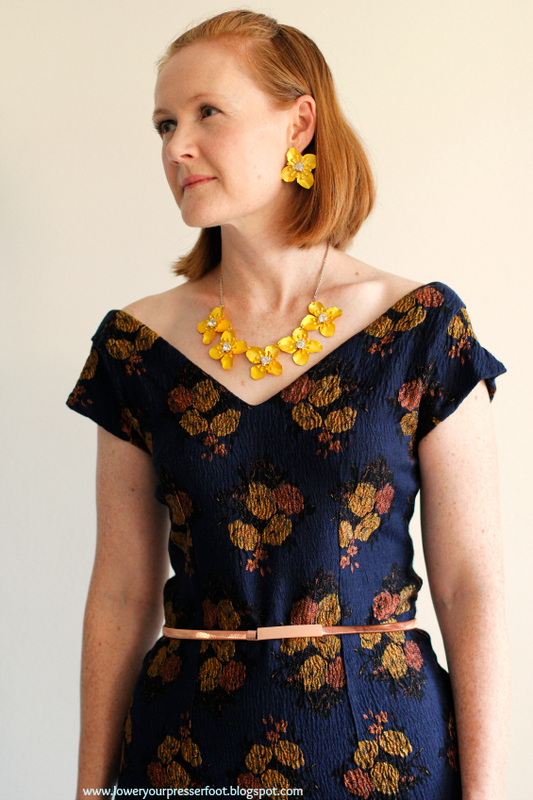 Aside from those gussets, the rest of the dress was really easy to make. In fact the hardest part was trying to press the seams without flattening the fabric too much, I ended up using lots of steam and just finger pressing the seams because the iron on the fabric removed that lovely crinkly texture. For the night I went all out on the gold - gold high heeled sandals, a gold belt, a gold clutch purse and of course those gold earrings & necklace. I'm not usually one to go over the top on accessories but it was a special night so I figured why not? 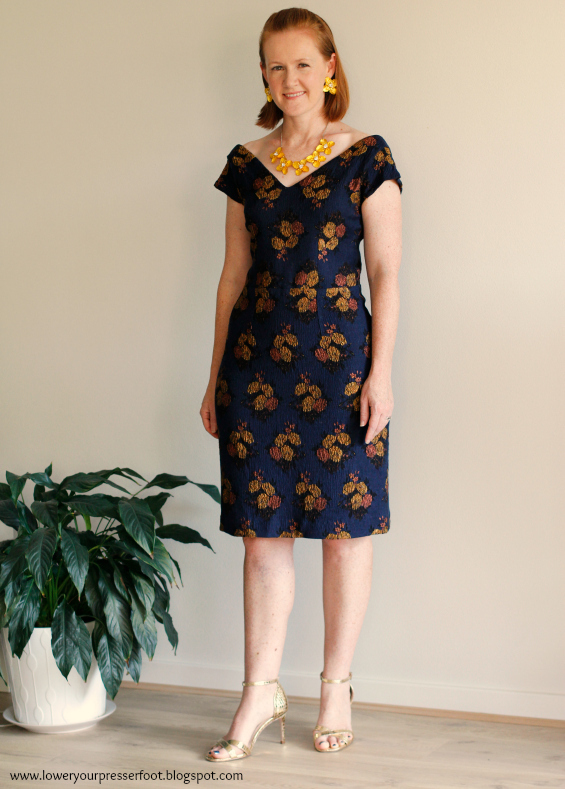 So it's because I love this dress so much, that I'm going to carefully unpick the seams and make it properly. This means steaming the fabric to make it shrink back to the original size, underlining the dress with silk organza and lining the dress. 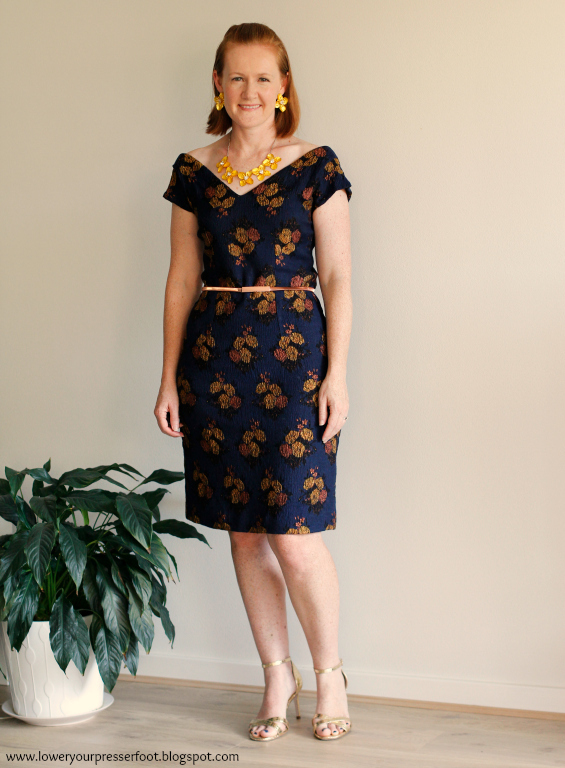 And then I'm going to make my husband to take me out to a fancy cocktail bar in the city so I have another excuse to wear it again because I know that for next year's Frocktails I'll probably make another last minute dress and I don't want this lovely dress to sit unworn in the cupboard! I've been very slow in starting my Burda challenge this year - here we are in the middle of April already and I haven't posted a single project yet. But I recently finished a project from the January issue, today started on a project from the March issue and am now posting my February project so I'm catching up. 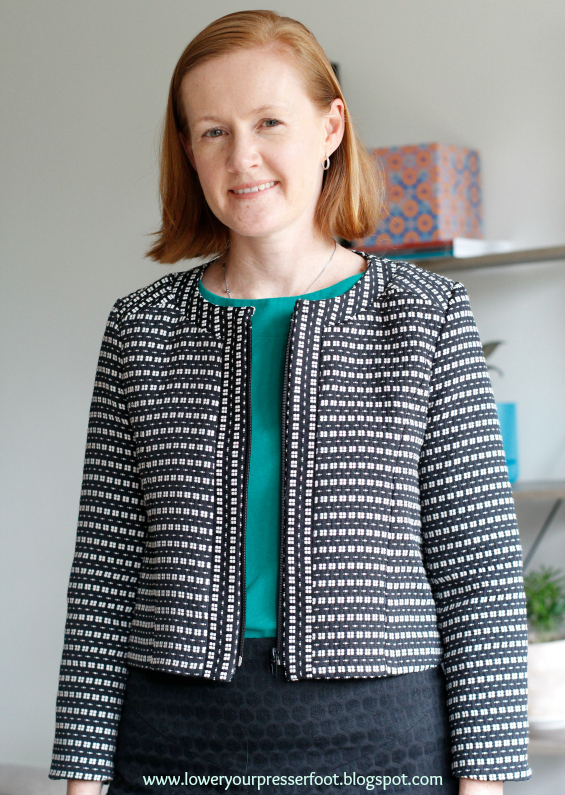 Since I am about 90% finished making a black and white boucle jacket with trim I decided not to use boucle fabric or any trim. 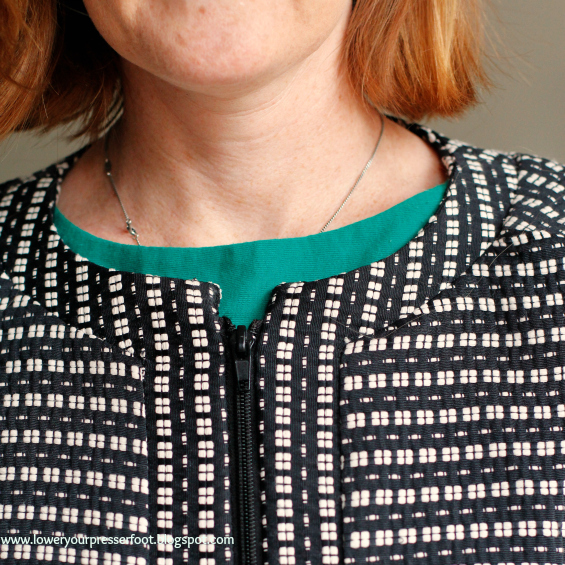 Instead, I used a woven black and white fabric that I bought from The Fabric Store a few months ago, and placed the front placket and shoulder bands on a different grain in place of using any trim. So, apart from that zipper I really like this jacket. It is an easy pattern to sew, although my fabric has a slight bit of stretch and tended to shift around a bit which made it difficult to align those stripes. I ended up dong a bit of hand stitching to keep them matched which helped to line them up even across the front princess seam. The one benefit of being flat chested is that the princess seam curve is rather gentle which makes it possible to match those stripes! When I wore this to work last week I received so many compliments so clearly it's a winner. 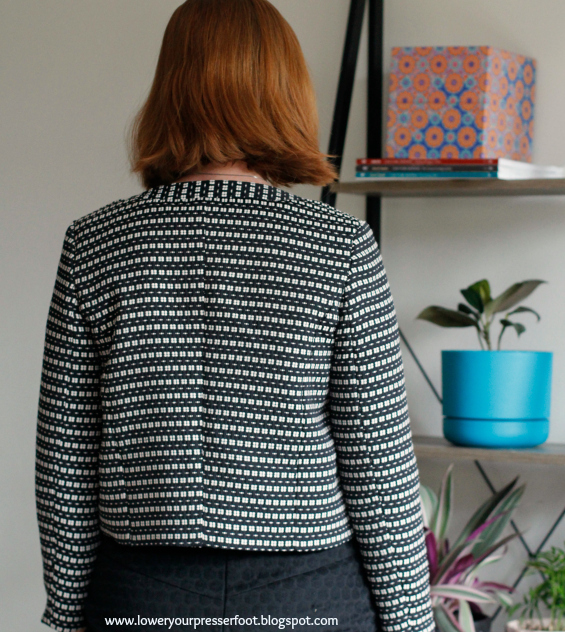 I recommend if you're planning to make this jacket to check the finished length to make sure it's right for you because it surely is short. Luckily this length works with this high waisted pencil skirt I'm wearing, because I really dislike having a small bit of top poking out at the waistline. And now to get my March project finished before the April issue arrives in my letterbox, fingers crossed I can catch up before it's too late and the year gets away from me. Psssst! Wanna win a Baby Lock overlocker? 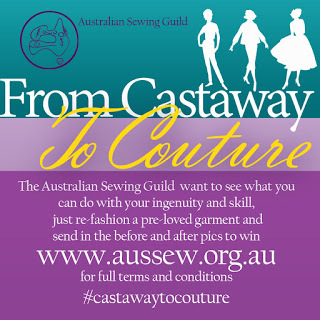 The Australian Sewing Guild is once again running its Castaway to Couture sewing competition and this year's first prize is an Eclipse DX overlocker from Baby Lock Australia. 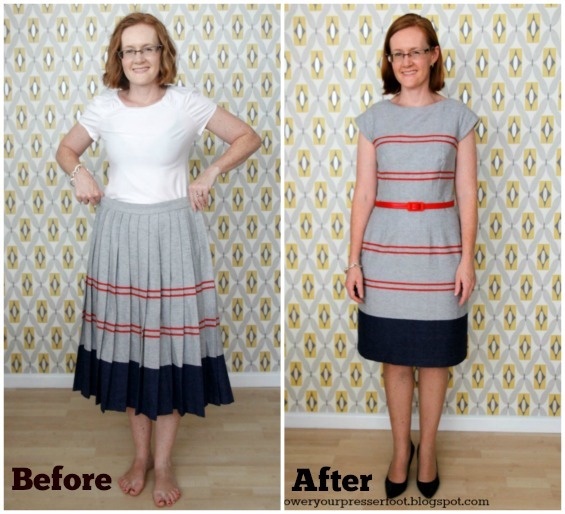 All you have to do is refashion a garment (or garments) into something new, take a photo and you're in with a chance! Even though I didn't win last year (I got one of the runner up prizes) I still got a great dress out of the process that I wear quite a lot, so that's a winner in my books. Thankfully I already have a Baby Lock overlocker because this year I'm all out of inspiration! Nothing is 'speaking' to me and I haven't found anything to refashion, so I don't think I'll enter. But the competition is running until the 31 May 2017 so it's not too late for any of you reading along to enter though. You don't have to be an ASG member to enter, but you do need to live in Australia or New Zealand. 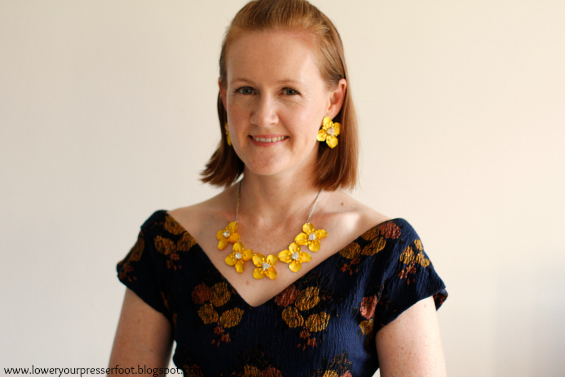 I'm not sponsored by the ASG in any way (just a happy member) or Baby Lock Australia (just a happy owner) - I just wanted to share the sewing love around. Those Baby Lock overlockers are amazing - the jet air threading and self regulating tension reduced my sewing frustrations hugely.